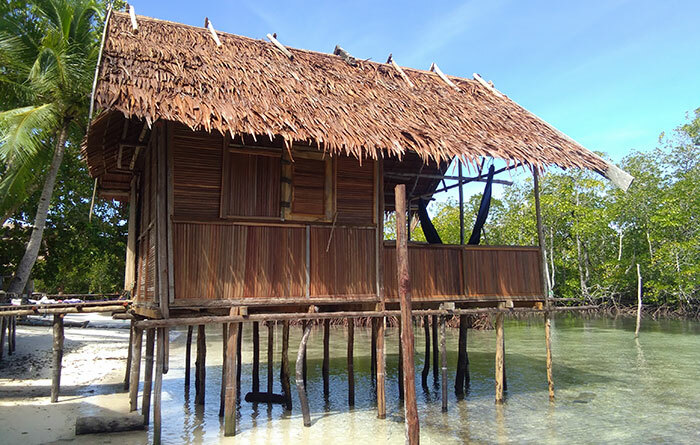 Walking Shark Homestay is a single private, over-water bungalow located next to Sawinggrai village on Gam. The bungalow sleeps two on a mattress on the floor. 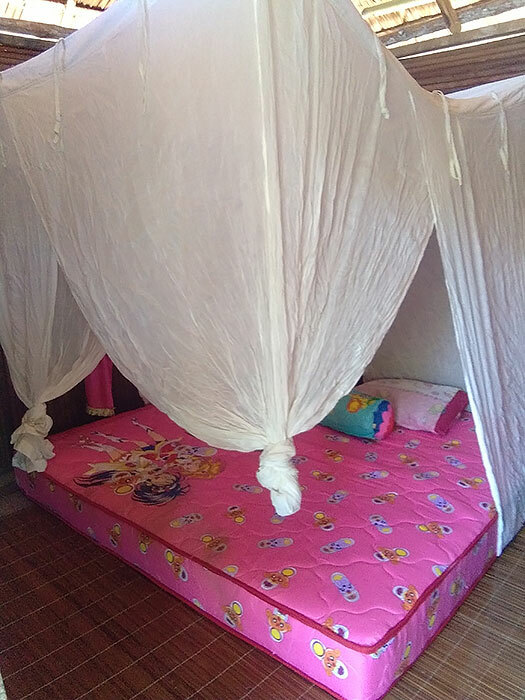 Mattresses are equipped with covers, pillows and a mosquito net. Meals are served on the bungalow’s spacious verandah, which has sea and sunset views. 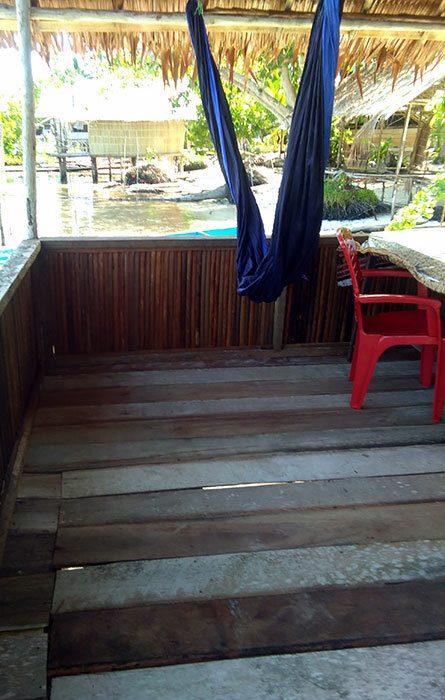 A two room bathroom shelter on land houses a western style toilet and a bathroom with bucket bathing for Walking Shark Homestay guets. Electricity is provided by generator and is available from sunset to around midnight and there is mobile phone reception, although it’s not a very strong signal. Basic English is spoken at Walking Shark Homestay. Boat transfers between Waisai and Walking Shark Homestay cost IDR 1,000,000 each way. The boat used can carry up to five passengers and the cost of the trip is shared between passengers. 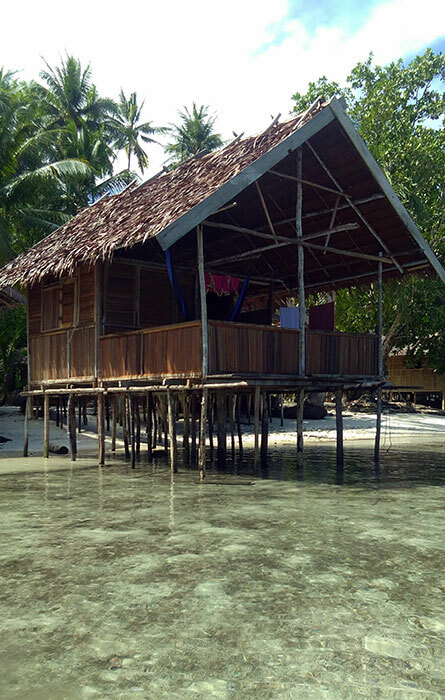 Located just to the east of Gam’s Sawinggrai village, Walking Shark Homestay provides a great base for experiencing a wide range of Raja Ampat’s attractions. 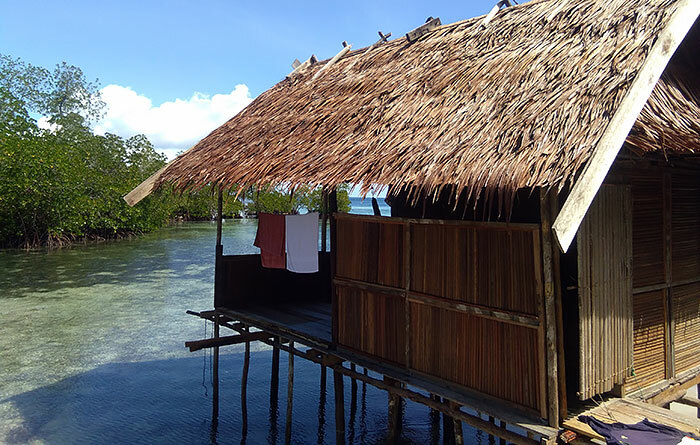 The belt of mangroves that lies between the homestay and the open ocean ensures the beach is always calm. The mangroves are a macro photographer’s dream, providing shelter to a wide range of nudibranch species and safe haven to hordes of juvenile fish. The Walking Sharks that give the homestay its name can also be observed sleeping among the mangrove roots in daytime, or patrolling the shallow lagoon at night. 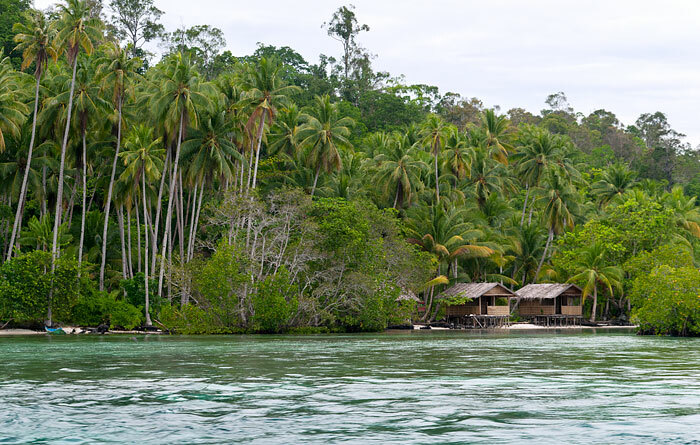 The mangroves and jungle that back the homestay are home to a wide range of wildlife, including scores of bird species and the pair of Waigeo Cuscus that have become nightly visitors at Nudibranch Homesty’s dining room. Rich coral reefs are right at the door and a steep dropoff into the depths is only a few tens of metres from shore. Be wary of extremely strong currents along the dropoff when the tides are running! The early falling tide makes for some great drift snorkelling though: If you’re a confident swimmer, enter the water at Walking Shark, then drift westward toward Sawinggrai. You can leave the water at Mambefor Homestay‘s jetty in Sawinggrai, or drift on to Kapisawar, the next village along the coast. You can also leave the water at any convenient spot between and return to Walking Shark on a concrete path that runs along the coast between the villages. Dawn displays of Red Birds of Paradise can be seen at Sawinggrai and schools of wildy colourful fish are fed every day from Mambefor Homestay’s jetty there. Walks along the coast and the exploration of Sawinggrai and Kapisawar are made comfortable by the above mentioned concrete path. Walking Shark can of course also arrange snorkelling and sightseeing tours to any other islands or attractions you might like to visit. Walking shark is the most basic of homestays I have stayed so far, but the people are amazing, very friendly and helpful. The food was also great and plenty of it, I never went hungry. 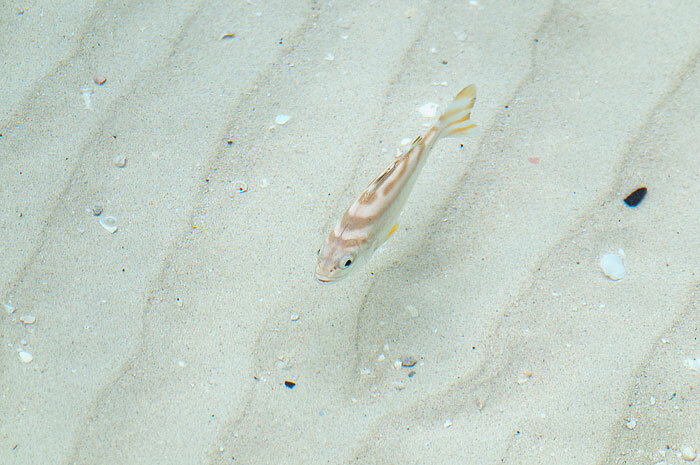 Snorkelling is great in the surrounding area, especially under the local jetty where huge schools of jacks hang out. There are some strong currents as you head west. Localised currents too where one moment you’re fighting against it and the next you’re going with it. But there are plenty of areas to exit the water so there’s no reason to not to try it. The area in front of the homestay is too shallow at low tide to snorkel but it’s only a short walk around to the pier. Stayed one night at Walking shark. The first Bungalow which was offered, the owner want to leave the same bed sheet from the former guest. oilet and shower need to be uergently mantained. Was nice having the food served on the balkon over the water and having two hamacs, was a bit noisy from the construction of the neighbor resort. I spent many days at the Walking Shark Homestay. Very nice place with very nice people. Nikolas, Mama Moti, Ben, Bapak Soni etc..all very nice and very authentic people. The food was always very delicious, Tee and Coffe was all time available. I just can recomand the place. I have spent 3 amazing days at Walking Shark which I will never forget. For me this has been the real homestay experience where you can meet and hang out with locals and you constantly feel being taken care of. I have stayed in 3 different places during my stay in Raja Ampat and I have to say the food was far the best at Walking Shark, every day something new and super delicious, loads of fish as well as vegetables. I even got some afternoon snacks which feels very good after being out snorkeling for hours. I really liked the view to the mangroves and also to go discovering all the weird creatures hiding among the routes. At low tide you can just walk 10 minutes to the village and start from the jetty there. I went every evening to watch the sunset together with all those lovely, cheerful kids in the village where everybody already knew my name on the 2nd day. I was there alone but I never felt alone. It was nice to sit together with Nikolas and his family on my deck in the evening, watching walking sharks and just sharing some moments… And don’t believe him if he says his English is not good enough because it is absolutely fine :) they took me to see mantas too which is another thing that I will remember till the end of my life. First we haven’t found them but they did not give up and we finally ended up swimming with plenty of these fantastic animals. Kristian, from Mandarin homestay nextdoor has also helped me a lot during my stay and he always had a huge smile and some good words for me. 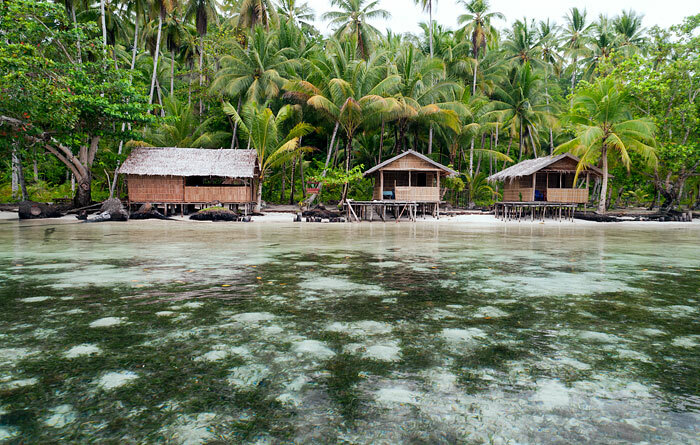 So if you are looking for a place where you can really live the Raja Ampat experience, where you are surrounded by super cool, friendly people and where you get probably the best food then do not look any further, you have found the place! Many thanks Guys to all of you for making my stay such pleasant, I will never forget and I hope I can return one day! Wishing you lots of success, great guests and happiness!!! I just spent 4 nights at Walking Shark and loved it! Mbak Fonny and her family are just beautiful. She’s a single mum who’s just set up this homestay with her younger brother, Nikolas. Fonny is a great cook. Having spent years living in this part of the world, I seriously struggle with the staple rice, veggie and occasional fish diet. I loved Fonny’s food, there was variety and the fish on my first night would be close to the best I’ve eaten. Her English is v limited but if you have some bahasa she’s just lovely to talk to. Nikolas I’ve decided is shy and a bit new to this… His English is better than he let on to me, perhaps because I could get by with my rudimentary Bahasa. If he doesn’t respond to a booking it could be because the Internet/reception isn’t great. The location is great. It is right between 2 established homestays – Mandarin, which looks out on the ocean, and Nudibranch, which is right in the mangroves. Only 20m or so to each. If you needed English assistance or help with organising tours/guides you could go there and it also means there are other travellers around to easily share costs with if need be. The bungalows are a good size, with an undercover deck to relax on when it rains and an open deck with comfy chair to relax in the sun. They are over water at high tide and open out onto the lagoon/ocean. Nikolas plans to build 2-3 more bungalows wholly over the water in March/April. Fonny’s kids are delightful! And the kids from the other homestays will also hang if youre keen. If I had my time again, I’d set something up more formal with teaching English for them. Bring some basic activities and they’ll love you for it. The bathroom is now competed. Mandi dip shower and western (ish) toilet. It’s very clean. I really would recommend this homestay. 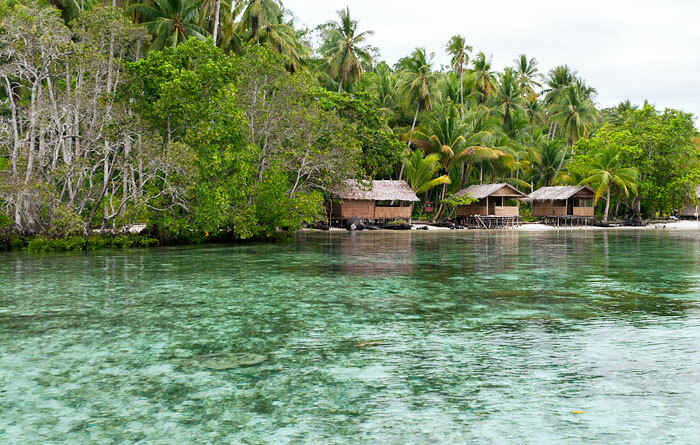 It’s got a lovely vibe and a beautiful Papuan family giving it it’s heart and making it work. I stayed in Walking Shark in november. It is a nice clean place and the food is good. For snorkeling it is a bit difficult to swim out. If it is not high tide it is better to walk to the village and start from the jetty of Sawinggrai. But there, it is really great. So many fishes, also big blacktip sharks, turtles, squids. It is fantastic.